Our range of mechanical die cutting presses is specially built for high speed applications where customers are requiring through cut or kiss cut solutions. A complete production line can be build up with standard modules (die cutting press, unwinding and rewinding units, edge and cross cutting, knock out systems, etc. The production speed of a typical mechanical press is about 180 strokes/min, and this can go up with our rotating press with a speed of 500 RPM. In addition of our mechanical presses we can also offer all surrounding equipment like slitting machines or guillotines in high speed application mode. 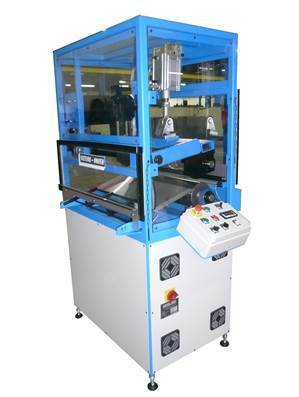 The reliability of our lines is proven and several hundreds of machines are running worldwide. Typical applications are: gaskets, seals, small foam parts, kiss cut products, etc.